Local Flavor: Taco Chic Salsa, it's addicting. Juanita Carmack was unemployed when her thoughts turned to the raved about salsa that was always in her fridge. Everyone said she should bottle it. So she did. Juanita quickly became a popular fixture at area farmer’s markets. 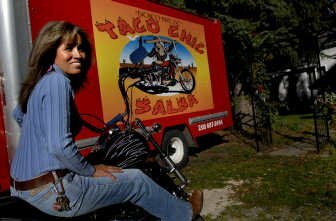 With her trademark Harley and infectious smile, she became known as the “salsa gal” or “taco chic.” One day a little unsure of the outcome, she loaded up the truck to try and sell it to grocery stores. After selling out with orders for more, she started to dream bigger. In 2003, Taco Chic Salsa was officially launched. Carmack moved into the a commercial building she called The Salsa Factory in Rathdrum, hired employees and expanded distribution. At The Salsa Factory, you can also get tamales, enchiladas and breakfast burritos to-go. The flagship Taco Chic Salsa and the authentic Mexican tamales recipes come from Juanita’s great-grandma’s treasured recipe book. Everything is just like grandma made it. There’s no artificial ingredients or chemicals. The salsa is available in mild, medium and hot. Juanita’s success was trumpeted by The Today Show and Country Living magazine, both of which recognized her as a top female entrepreneur in 2008. 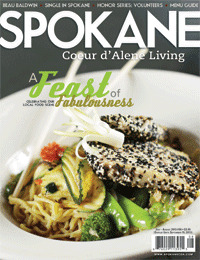 Taco Chic’s popularity has grown beyond the border of Idaho. The hard-to-stop-eating-salsa is carried at Super One, Trading Company, select Yoke’s and Rosauers, Pilgrim’s Market, The Rocket Market, Huckleberry’s, URM, and even DeLeon Foods. Of course, you can always order online or take a delicious trip to Rathdrum and buy it where it’s made. That’s where you’ll get a greater understanding of the heritage and be able to witness the slow process and passion put into every jar. Local wine pairing: Taco Chic Salsa is nicely complimented by Bebop, a dry Riesling from Nodland Cellars. It's a great food wine and plays well with spice and or heat.